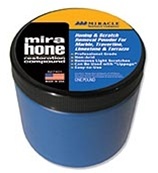 Mira Hone is a unique, natural, non-wax powder compound for honing and deep cleaning. Its non acidic formula can effectively be used on floors with “lippage” to remove scratches, etch marks, light weight traffic patterns. It can also be used to prepare the stone surface prior to using one of the Miracle Sealants final polishing products. All previous applied coatings and/or waxes must be removed using Mira Strip or H2O Strip as directed. 1. Apply a small amount of water to the stone surface. Work in approximately 25 - 35 square feet at a time. Do not work large areas. 2. Sprinkle a handful of Mira Hone onto the wet surface (approximately 5 ounces per 25 square feet). 3. Buff the Mira Hone with a Marble Master floor machine creating a slurry with a natural hair brush or pad for approximately 10 minutes per 25-35 square feet. 4. Move slurry aside with a squeegee. Check for desired results. Work longer if necessary. Move the slurry to the next section and add Mira Hone and water as needed. DO NOT ALLOW Mira Hone TO DRY ON THE SURFACE. 5. Remove excess slurry with a wet vacuum. Damp mop and let dry. 6. For a higher polish, the surface is now prepared for one of the polishing compounds: Marble Conditioner, Mira Dust and MiraPolish. Used as directed, Mira Hone will cover approximately 80 - 115 square feet per pound (7 - 11 square meters).